Given the state level employment estimate issues that affect both Oregon and nearly all states since BLS retook control of the estimates back in 2011, it can be difficult to tell just what is going on in the labor markets in any given month. As BLS mentioned, one of the goals was to decrease the bias in the monthly estimates – not that there were in in Oregon’s data, but possibly in some other states – but that may increase the month-to-month volatility or variability. That is one reason our office likes to step back and examine longer term trends, rather than just the monthly changes. Furthermore the preliminary benchmark process our office uses allows us to incorporate the more complete count of employment, available via the QCEW, rather than relying solely on the monthly employment estimates produced by the BLS. The graph below shows the official Oregon data (dotted blue series) and also what we expect the revised series to look like when the next set of benchmark revisions are released next March. As for the month-to-month volatility, Oregon’s September data can certainly attest to that. A month ago, the preliminary estimate for September was a loss of 7,900 jobs, however today the revised figures show a loss of 800, or a reduction of about 90 percent. Now, job losses are still job losses and it is not good news. We also know that withholdings out of wages and salaries were weak in September, which is indicative of employment weakness, although both employment and wages are certainly up on a year-ago basis. In discussions with colleagues in other states, almost all states have seen a slowdown in withholding growth in recent months relative to earlier in the year. 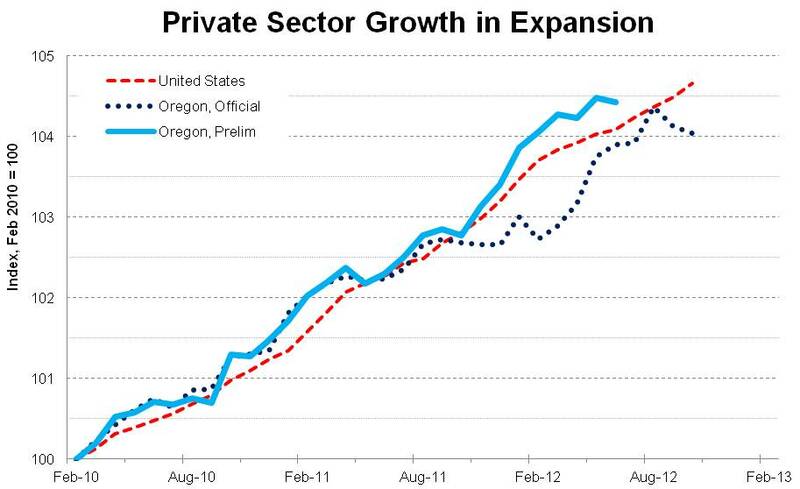 In Oregon, withholdings are growing about 2-3% year-over-year in the past few months, although a lot of other states are seeing 0-1% growth. Neither of those figures represent good growth rates, however they do remain positive. Overall, labor market indicators show that Oregon is growing right along with the nation as a whole, if not just a bit faster. The downtic isn’t the result of the shift from summer seasonal employment and a lack of hiring for winter seasonal employment, is it? It certainly could be. Also the specific year by year seasonal factors do affect the numbers somewhat. Each year’s seasonal factors are slightly different than other years – which they should be – however, like a lot of things, the precise level or factors are best viewed in hindsight, along with the annual employment revisions. One item I’ve been looking at is the year-over-year growth rates in the non seasonally adjusted numbers. These have actually been pretty consistent for the past 4 to 6 months, although not at particularly strong rates. Total Nonfarm is about 1% y/y while Private Sector is 1.2-1.6% y/y. Are those 1% and 1.2-1.6% numbers before or after adjusting for population growth? Those are straight employment growth figures based on total counts. They are not adjusted for population or labor force growth.